Hollybeary Creations : Newton's July Release Sneaks Day 2! 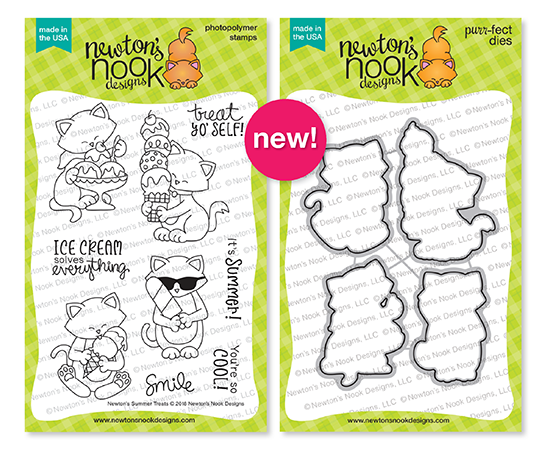 It's day 2 of the July Release from Newton's Nook Designs and the celebration is still going! Today we are introducing Newton's Summer Treats and Cozy Campers. Both of these sets have coordinating dies as well. If you missed Day 1 be sure to scroll down or head over to the Newton's Nook Blog to catch up! I paired this Adorable set with some Fun pattern Papers from DoodleBug Designs. 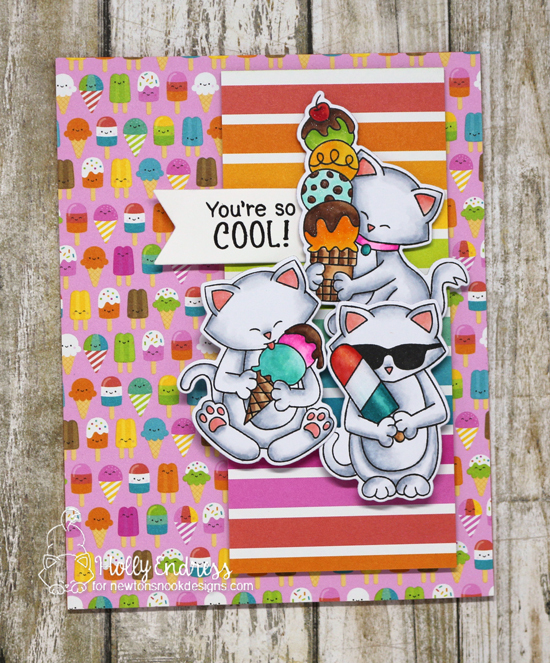 I adhered the papers to the card base and then I stamped and colored the kittens with Copic Makers. I used the coordinating dies to cut them out and adhered them with some foam tape. I die cut a sentiment strip using the Frames and Flags Die set. I added some Clear Wink of Stella to parts of the images as well for a touch of Sparkle. Up next is Cozy Campers... This is such a Fun set and I have so many ideas brewing for this one. I used some Distress Inks to Watercolor the images as well as create the background. I used the larger Frames in the Frames and Flags Die Set as well to matte the image. I wanted it to look like it was a photo you'd hang on a wall. This set includes two camper images and lots of fun little extras you can add in to create a scene. Comment on the NND blog and Design Team blogs (see list below)! The winner will be chosen at random from the collective reveal posts. Make sure to check out each of their blogs and comment for your chance to win. You will not know which blog has been chosen so the more you comment on the better your chances are of winning! You have until Thursday July 19th at 9pm EST to comment -- winners will be announced on the blog post on Friday, July 20th. Really cute cards and gorgeous colouring! I love Newton with his yummy treats! Such adorable cards! Love the camper scene! This is a must have set. Your cards look amazing. I love this gorgeous new set! And love your card. Such fun and summery cards...love how you clustered all the Newton images on the rainbow banner. Cute cards! Thanks for the chance to win. 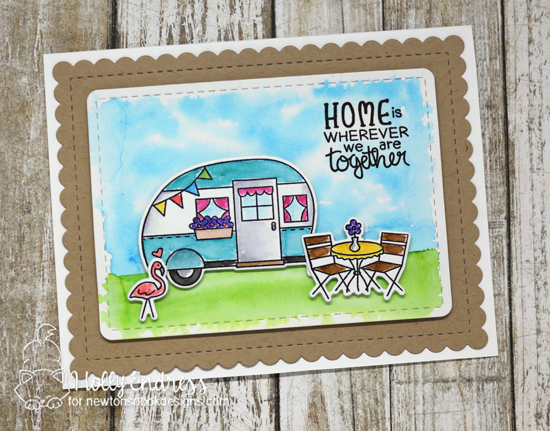 I love the popsicle paper background and the scallop around the camper scene! Awesome work! They just really make me happy when I look at them!! AWWWWWW CUTIE PUTUTI cards! Especially the first card! I really love the Ice Cream card paper background! And the colors and coloring that you did on those cats is absolutely beautiful!!!! I'm loving all those cool kitties and their ice creams!! My cat loved ice cream as much as I do!! I love how you did group the cats together. It's really cute!! Very cute cards. I'm loving this release so far! Just loving these new stamps. Can't decide which is cuter-the campers or the kitties with ice cream! Wonderful layering on the first card. 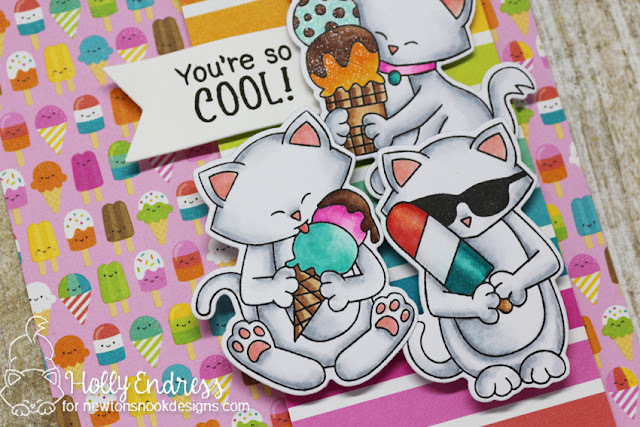 oww kitties icecream and doodlebug! what more could we want! Your cards are fantastic ! I like the papers on the cute ice cream card and love the camping scene. Love your cards, so they are so fun and summery! Such beautiful cards! Love the colorful scenes that you made with these fun stamp sets! Again today, your cards are so cute ! Wonderful cards! I love your kitties with all their cool treats! 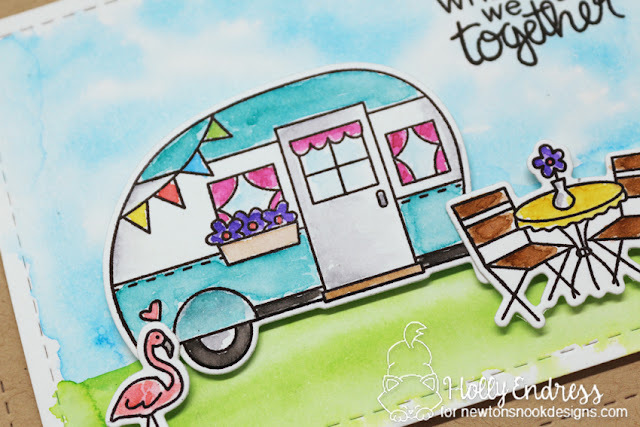 The colorful summer treats card is a lot of fun and I love the camping scene too. Cute cards!